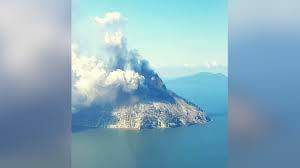 A volcano situated in one of the 6 volcanic islands in the SCHOUTEN group of islands situated about 21 km northeast of the mainland of East Sepik Province has erupted at the summit. Authorities don’t have instruments on the island to accurately measure activity but are relying on eye witness accounts from the mainland and satellite photos. It is now a cause for concern for around 500 plus people living in and around it. The last ramblings from this particular volcano was back in mid-2015 and authorities are monitoring the situation very closely at present.